Beverly's Official Blog | News and findings from world of crafts, scrapbooking and more: How-To Project of the Week: Spooky Wall Pockets! These Halloween hangings are perfect for indoor/outdoor decor! Halloween decorations need not be hokey! 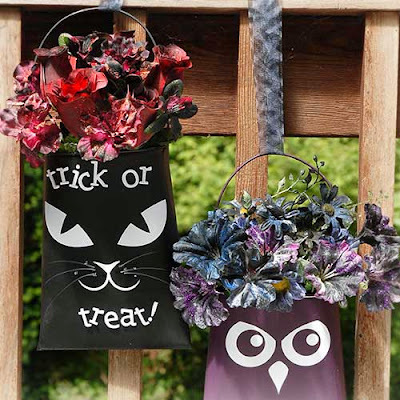 Add a little elegance and seasonal floral flair to your collection of Hallow's Eve decor with these wall pockets. Each pocket is crafted from a lightweight metal that is durable and long-lasting, allowing you to reuse them year after year--and for occasions other than Halloween, too. Once the pockets have been decorated, simply fill them with a floral arrangement of your choice and hang where you please! View the rest of our informative how-to projects on our homepage. With the holidays quickly approaching, you'll want to start formulating your seasonal craft ideas ASAP! Beverly's online fabric store wishes you happy, productive crafting this Halloween season.